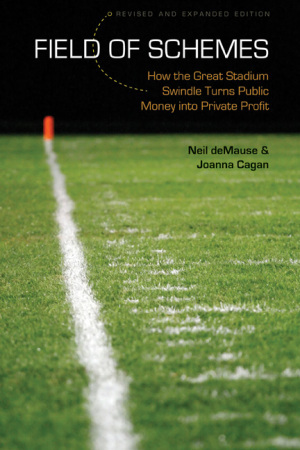 Because I was good, or at least while Santa was watching, I received as a Christmas present the book Field of Schemes: How the Great Stadium Swindle Turns Public Money into Private Profit written by Neil deMause & Joanna Cagan. The book, published originally in 2008, was updated this year. If it is as good as I expect it will be, I will be publishing excerpts as I make my way through the book. We also discovered the popular notions of the villains and the heroes in the battle over sports-franchise blackmail was upside-down. Although newspapers had portrayed the public as unthinking fans who demanded their elected officials keep teams in town at any cost, we instead found hundreds of citizen activists who had been fighting city by city for years to stop public money from going to private profit. Corporate welfare, they called it, and understandably so. Meanwhile, the local politicians who had pleaded that they had no choice but to give in to sports owners' demands turned out to be eagerly lining up to build sparkling new luxury boxes - where they then happily attended games as the owners' special guests. As one fed-up resident told us, "They're not public servants. They're corporate servants." 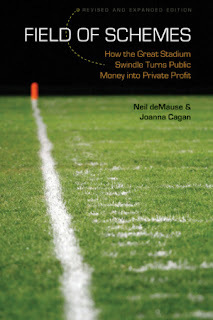 This book began because we were frustrated with free-agent franchises demanding money as the price of their loyalty. But this is far more than a sports story. It's also a story of deceptive politicians, taxpayer swindles, media slants, the power of big money, and most of all, a political system that serves the rich and powerful at the expense of the average fan, the average taxpayer, the average citizen. That description is Indianapolis politics in a nutshell. The local body politic is screaming at city officials to stop giving away our tax dollars not only to billionaire sports owners, but also to every politically-connected corporate interest that comes knocking on their door. The politicians though, enticed by perks and campaign contributions, arrogantly turn a deaf ear to the public, with large majorities still continuing to vote to continue taxpayer giveaways, while complaining, but voting for, cuts in city services and tax increases. Meanwhile the local newspaper is not only silent to the abuses, but is actually one of the investors benefiting from corporate welfare. Indianapolis politics though has an added dimension. While challenging the city's tradition of corporate welfare would be immensely popular in a general election, insiders have historically so dominated the anti-democratic slating (endorsement) process of the parties they can insure that a reform-minded candidate who would stand up for taxpayers against the corporate elites would never be in a position to get the nomination. The only reform-minded mayoral candidate who ever slipped by the insider-rigged system, not only getting nominated but elected, was none other than Republican Mayor Gregory A. Ballard who pledged on election night in 2007 to bring an end to Indianapolis country club politics. Mayor Ballard's ascendancy and quick capitulation to the City's tradition of corporate welfare, before even taking a seat in the Mayor's chair, is a lesson of how reform-minded interests need to be as vigilant about winning the transition as they are about winning the election. The book Field of Schemes, which has a price of $19.95, can be ordered through this link. Building Sports Stadiums by Kevin J. Delaney, Rick Eckstein. The TV Stations and The Star has never really questioned the Corporate Welfare Programs and Crony Capitalism for the Colts and Pacers. The Media here never challenges the basic question of if it right to build and maintain stadiums from Public Funds. The Star is like the old Soviet Pravda. They selectively report on the CIB. Marion County will keep raising taxes and fees until the county dies. There is too much self interest, too much cronyism and too little regard for the taxpayers. Have you ever noticed the big shift in Dr. Mark Rosentraub. He used to be on the side of the taxpayers. Now he's thrown in completely with the sports team owners in the "professional" opinions he provides whenever these discussions come up. It's obvious he's been bought off by the sports team owners. The good doctor's opinion is now just another commodity to be bought and sold. When will any of these so called impact studies be run by someone who isn't already bought and paid for? Authors DeLaney and Eckstein presented their work at U of Indy while the stadium was being debated. Dennis Ryerson attended that presentation, but the Star gave it almost no ink. Imagine that. "They're not public servants. They're corporate servants." I think this pretty much describes ALL of American government.